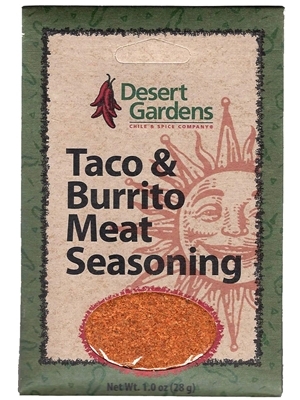 Desert Gardens Taco & Burrito Meat Seasoning brings the flavor of the Southwest to your table in just minutes! Add this seasoning to 1 lb of ground beef for some of the best tacos and burritos you've ever had! Or for another special treat, place seasoned ground beef over tortilla chips, top with your favorite cheese and microwave! Add mix to water. Let sit for 3-5 minutes. Add to 1 lb ground beef. Cook, drain and serve. Oats, salt, paprika, dehydrated onion, garlic, red chile, citric acid.